An American classic gets revamped with a spiced up spin. 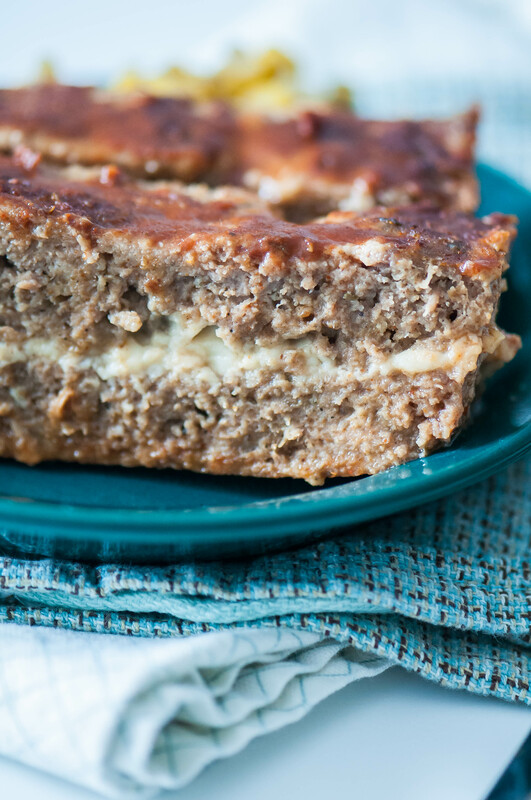 This Mexican Meatloaf is stuffed with queso fresco, pumped full of Mexican spices and slathered in enchilada sauce to create a fun new way to eat a family favorite. It seems like meatloaf is quite a controversial food. People seem to either love it or hate it and it can divide families. I know from experience. My mom is a meatloaf hater and I have never understood such a thing. She even refers to it as meatlog, which makes it seem quite unappetizing indeed. Ew, right? When it comes to my little family all but one of us like meatloaf. I bet you’ll never guess who doesn’t like it. Yes, Noah the one who hates all things uncarby and uncheesy. Yes, I made those words up and I’m leaving them there. I hope that you and your family love meatloaf because I’ve got a fun new spin on the dinner classic. Mexican Meatloaf friends and it’s going to change your life. And maybe revert those meatloaf haters out there. I used my favorite Mexican spices (cumin, chili powder and oregano) throughout the ground turkey to spice it up and give it a major punch of flavor. If you aren’t a fan of ground turkey, feel free to substitute ground beef instead. I’ve just been trying to keep things lighter so I went with the leaner option. And if you were worried about it being dry, don’t because there is a layer of cheese in there friends. To top it all off, it’s slathered in enchilada sauce for another layer of Mexican flavor and goodness. So dryness is not a factor in this meatloaf. I told you not to worry. I used homemade enchilada sauce since I had some in the freezer and I prefer it to store-bought. It only takes about 10 minutes to make your own and uses basic pantry staples so if you have the extra time you should definitely whip up your own. It makes a big batch so you can freeze it in portions for future use too. But if you don’t have the time or desire to make it from scratch, the canned stuff will work just fine here. This meatloaf takes a little longer than the usual weeknight dinners I share but only because it has to bake for an hour. The prep time is around 10 minutes making it a quick and simple meal to prepare. Serve it with roasted corn and a Mexican salad to make the perfect meal. Preheat oven to 350 degrees F. In a large bowl, mix together the egg, breadcrumbs, garlic, onion, cumin, oregano, chili powder, salt and pepper. Crumble ground turkey into the bowl and mix with hands until the bread crumb mixture is evenly distributed. Press half the turkey mixture into a loaf pan. Sprinkle with queso fresco over the turkey and spread evenly. Drop the remaining turkey in blobs over the cheese and carefully spread it evenly, covering the cheese. Cover the pan lightly with foil and bake for 30 minutes. Remove from the oven and pour the enchilada sauce over the meatloaf, spreading evenly. Return to the oven, uncovered, and cook another 25 to 30 minutes.